The initial idea came about ten years ago when I saw a little aquarium with two Beta fish in it. They were separated by a wall. I was at my brother’s house, and my niece had the little aquarium sitting on her desk. It struck me as…sad. Two fish in one aquarium–basically sharing everything–except the knowledge that another fish existed close by. And, as the years progressed, the idea itself picked up more and more steam–and more and more context. It became–not only a story of two lonely fish separated by a wall–but a larger story of two fish becoming friends–and specifically, becoming friends through the sharing of ideas–which is when the fish go from black and white to full color. I think this is a really interesting idea, and I hope it appears in all of my books. The idea of accessing the wonder which actually already exists in our world–through the use of our imaginations. Tell us about the translation process. Rhyming in both English and Spanish seems like a daunting task. Well, it begins with Rhyme, doesn’t it? I mean Rhyme itself is a very integral part of this type of early reader picture book. It is how children who are learning to read figure out how words sound. It is how I started. I started off with rhyming books when I was young–and it led me to become a professional musician and composer. I love music, but I am obsessed with the “musicality” of language. So, from the very beginning. The Amazing Watercolor Fish was going to rhyme. It wasn’t a decision. It is how I write. However, it was actually my editor Gabriela Baeza Ventura’s idea to make The Amazing Watercolor Fish rhyme in both English and Spanish. Gabi approached me with this idea at a conference, and to be quite honest, it was the reason I signed with Arte Público. 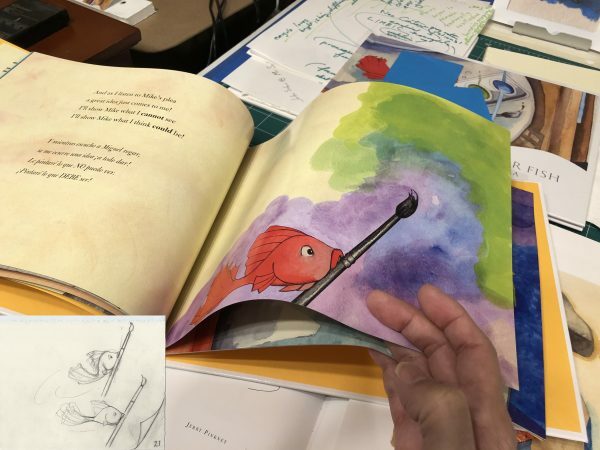 I figured any person with this much vision and enthusiasm for the book was someone I wanted to work with, and I knew that The Amazing Watercolor Fish had finally found its true home. But we needed someone truly remarkable to pull off the translation. In my mind, there was only one person. Carmen Tafolla. I needed someone who would not only be in love with the Spanish, but also, with the English version of the book. And, I needed someone who wanted to have fun. Of course Carmen knocked it out of the park! We knew right away, this could not be a word-for-word translation. We concentrated instead on capturing the emotion and drive of every spread–and every picture. To me, it seems like two books in one. And I think, that’s pretty profound. The goal was this: Everyone, regardless of the language they spoke, should be able to pick up the book and have a wonderful experience. Children should want to read it over and over again. That’s exactly what I think we accomplished. When you do school visits, how do the students react to seeing a text in both languages? Well, you know, for most kids, it’s transparent. And that’s the way it’s supposed to be. 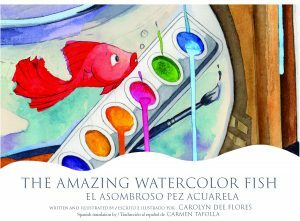 When we had this idea of making The Amazing Watercolor Fish into an early reader that rhymed in both English and Spanish – I thought Wow! What a great idea! Because, a lot more kids are going to have access to it. And that…actually did happen. But it was challenging–design-wise. Spanish is a robust language. It takes more room. We had to more than double the amount of space required for text. And in an early reader, space is everything! There has to be plenty of space around the text to make it easy to read. The font had to be perfect, as well. 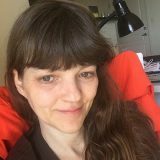 The font had to be clear and concise and obviously accessible in either language–and obviously discernable in either language. But as far as the kids are concerned–it doesn’t make a difference. The real difference is with parents! I speak at Literary Nights, and when parents see the book in both English and Spanish, it’s very moving. When they hear it read in both languages…sometimes they cry. I can see they are proud. And, that is one thing I think people miss about picture books, something they constantly overlook–the power of a picture book being read aloud. For me, hearing The Amazing Watercolor Fish in both languages is a thrill. It far exceeds anything I expected when I started. This was the first time I painted Mikey – Happy Birthday! The illustrations are gorgeous. 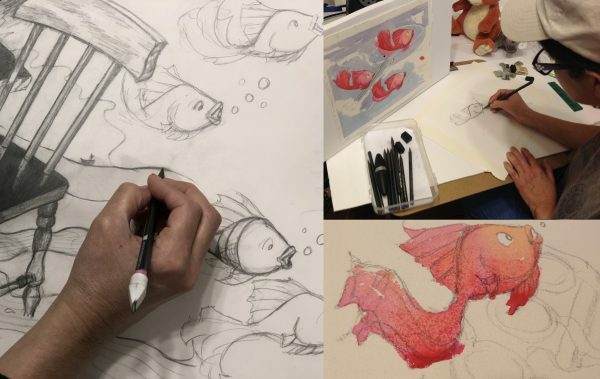 Can you tell us about your illustration process and your fish models? I can tell you that I worked on the illustrations for The Amazing Watercolor Fish for 10 years. I still have the napkin I sketched the original idea on. Two fish divided by a wall and the words “knock, knock” above. But ten years ago, I had just begun to illustrate. I was developing my technique. I was trying to figure out my world. 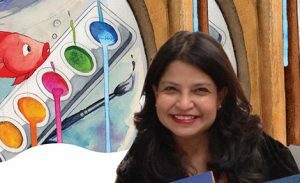 I wanted my characters to be an extension of my art studio–a world that I love and live in. It took me years to become comfortable with my characters in drawn form. And so, modeling them in Play-Doh really helped! But the moment a character is born, you know it! The moment I draw a character and it comes alive–I write the date underneath it–so I will remember that character’s birthday. Just like in this picture below. So, when I begin the process of creating a book, even before I create the storyboard, I start with sketches. Sometimes I don’t even sketch on paper. Just whatever’s handy. Sometimes pieces of wood, or whatever. Sketches upon sketches upon sketches. They’re all over the place. Drawings for The Amazing Watercolor Fish took about a year. And this is really important: Because it means you have Passion. This book’s Idea has to burn within you. Because it’s going to be a very long haul. So… first comes the idea. Sometimes the picture stays the same all the way through, from thumbnail to final illustration. 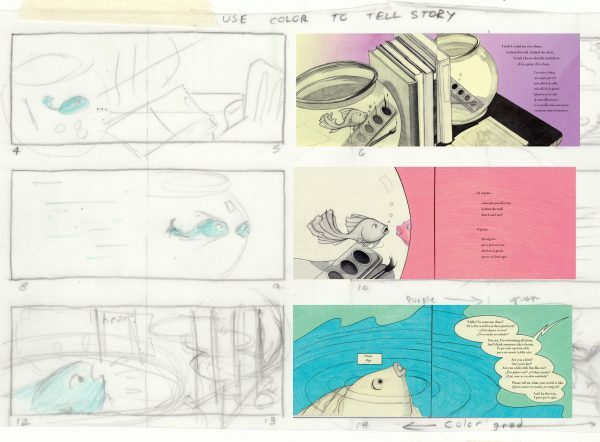 For The Amazing Watercolor Fish, the storyboard was where everything came together. It became the backbone and Shape and Design of the book. Sometimes, the picture changes a bit – but retains the original idea. I believe there are four levels to a great picture book. The first level is the text. The second level is the illustrations and text together visually. The third level is auditory–how the book sounds read aloud. The fourth level is Design. But what really excites me about picture books is how these all work together. 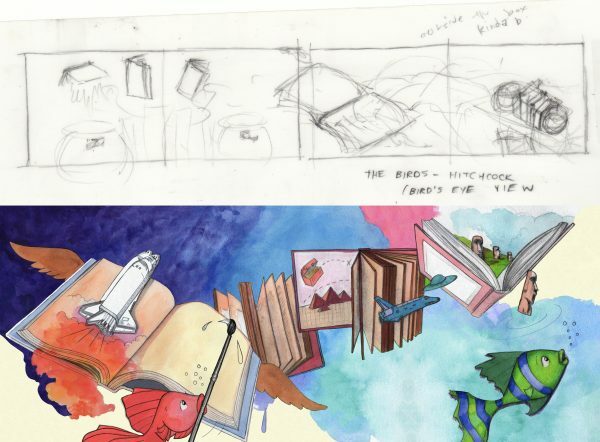 A picture book is a seamless, merged experience. Page turns are really important – so they are a major part of the design of the book. And that experience is even more vivid for children. I have seen kids immerse themselves, physically, in a book. They sit on the floor. They open up a book and it’s bigger than them. It envelops them. They live in this world. Ultimately, I think that’s what picture book writers and illustrators want, too. We want to immerse ourselves physically in a book. We want to live in that world. I know I do. And there is so much more to come. 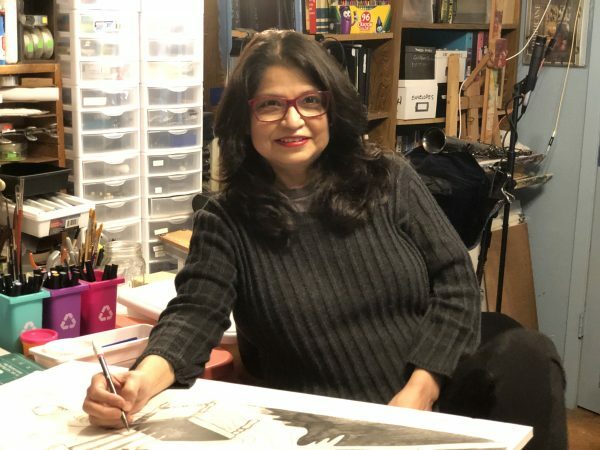 Carolyn Dee Flores loves books so much, she started writing and illustrating her own books when she was in second grade. Her father was in the U.S. Air Force. So, her family traveled all over the world. But everywhere, always, her favorite thing was reading books. 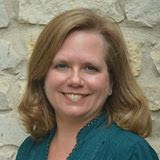 When Carolyn grew up, she attended Trinity University, and worked as a computer analyst. She became a professional rock musician and a composer. She wrote soundtracks for television and film. But finally, Carolyn came back to what she loved the most–writing and illustrating children’s books. 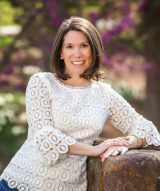 Carolyn will be teaching a webinar for Nebraska SCBWI on April 13, Finding Your Forte in Children’s Books. 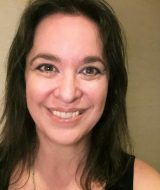 She will also be teaching Nurturing Your Artistic Voice: A Guide for Kidlit Rebels and Risk Takers at Highlights Foundation in September. You can find her on Twitter, Instagram and YouTube. All illustrations in this post were created by Carolyn Dee Flores and are used with permission.